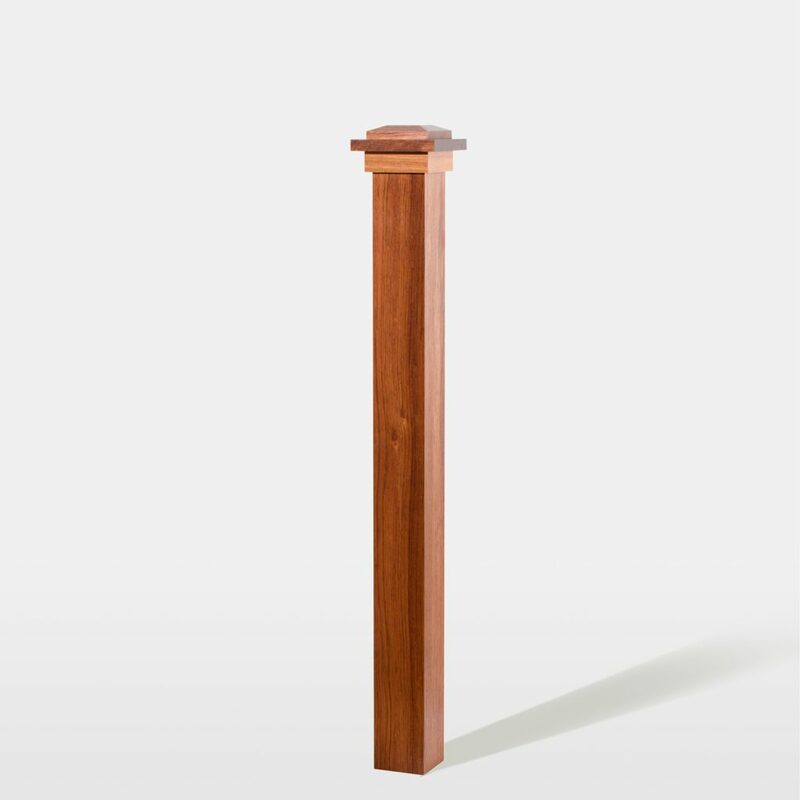 Craftsman style from cap to base, the 4130 Box Newel is extremely versatile. Choose from one of our many of wood species, such as Ipe, Brazilian Cherry, or Walnut, and select a finishing option to reveal the beauty of the natural wood. 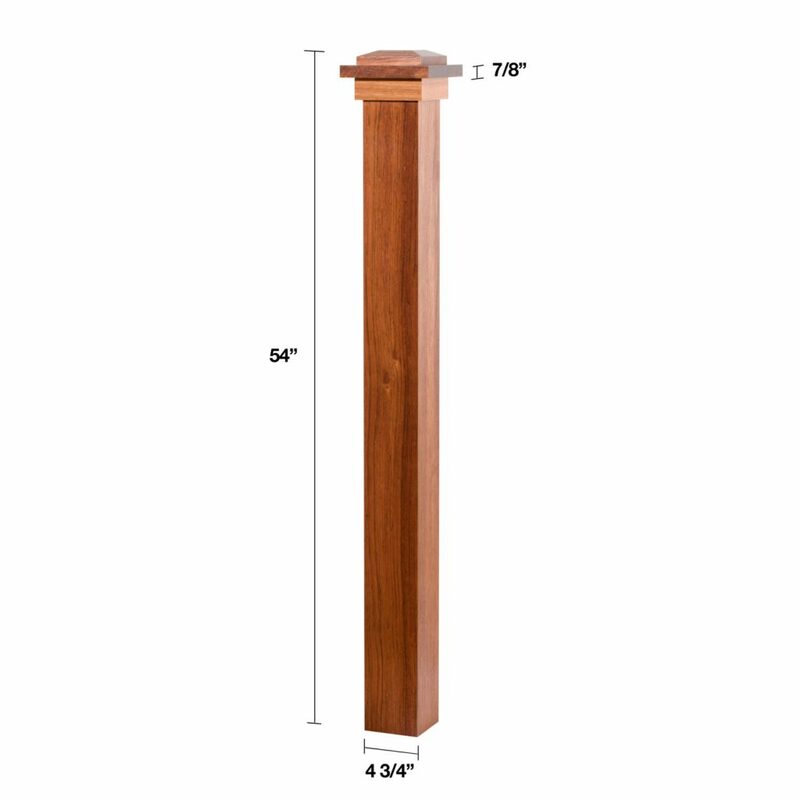 This 4 ¾” square box newel stands 54” tall, but can be adjusted on-site to fit your stairway perfectly. Top off this timeless box newel with either a beveled or flat cap and enjoy your ideal Craftsman Series Box Newel. To install your 4130 Box Newel, you will need the Box Newel Mounting Kit. Follow our Installation Video to ensure a secure fit. The Box Newel may be installed either on the surface of the stair tread or beside the tread. Due to their precise edges, we have found that Box Newels look best on a square starting step. Join handrail to your 4130 Box Newel using a rail bolt kit. Many configurations allow handrail to mount directly into the newel; however, if your handrail is joining with your box newel on a rake, you may also require a gooseneck handrail attachment. Can this fit as a sleeve over a standard 4×4? Unfortunately no, the inside dimension is 3 1/4″. And you probably wouldn’t want to go much larger than 3″ in order to ensure the post fits snugly. Do you have any photos of the flat cap style, as opposed to the beveled? Thanks!! The product photo uses a box newel manufactured out of Brazilian Cherry with a Clear Finish. This post is manufactured at a standard 54″ length. However, you may cut the post to a specific length on-site with a table saw.